I always say that the only reason I eat toast is so that I can enjoy some butter and fruit jam! For a long time I’ve been single focused on the Trappist line of jams, the blueberry being my favorite. I’m happy to say that this product is both organic and Non-GMO verified. 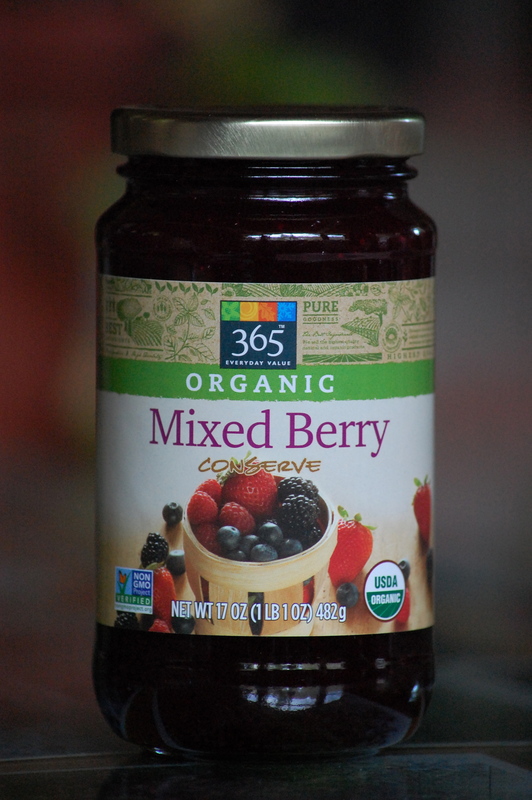 So, my new favorite fruit spread for my morning toast is in the photo above – 365 Organic Mixed Berry Conserve. It is so full of flavor! And I think the sugar content is a tad less than most commercial jams. It has 10 grams of sugar in one tablespoon. I had tried a Trader Joe’s mixed fruit organic spread that had 8 grams of sugar and it was kind of dull. The perky fruit flavor of the 365 brand just didn’t come through. At a generous 17 ounces, this jar lasts me about three weeks, maybe four. Give it a try and share your tastebud’s thoughts in a comment!